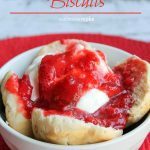 Strawberry Shortcake Biscuits Recipe - The Perfect Summer Dessert! The arrival of strawberries every year means it’s officially fresh fruit season, and I always celebrate with my family’s favorite strawberry shortcake biscuits recipe. Nothing says summer more than strawberry shortcake, and if you make it with biscuits, you may never make it any other way again! My mom always made it this way, and I’ve carried on the tradition for my own kids. They love it now just as much as they did when they were littles. Hull and slice a quart of fresh strawberries into a bowl, and then sprinkle sugar liberally over the top. Then take a potato masher and smoosh it all up. 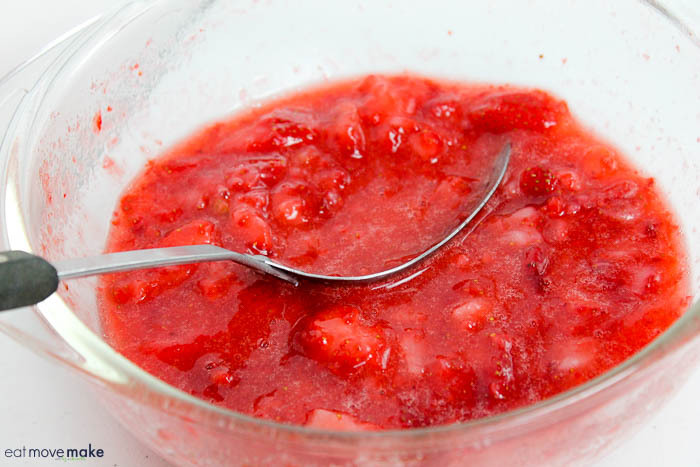 You want the strawberries macerated and really juicy! Bake your favorite kind of refrigerated biscuits, and when they’re nearly ready, melt a stick of butter. You’ll spoon the melted butter over the freshly baked biscuits. You want them to be quite saturated. Trust me, it makes all the difference. Then top the buttered biscuits with strawberries and a dollop of whipped topping. Nothing says summer more than strawberry shortcake, and if you make it with biscuits, you may never make it any other way again! Hull 1 quart of strawberries and slice them into pieces. Put in a bowl. Sprinkle sugar liberally over the top of the strawberries and then smoosh, smoosh, smoosh. You want them to become nice and juicy. Melt 1 stick of butter or margarine in a bowl. Split open the biscuits and line a bowl with the halves. Usually I use 3 biscuits per serving, but these were very large, so it only took two to fill the bowl. Repeat with remaining biscuits in more bowls. Spoon the melted butter or margarine very generously over the biscuits. Now spoon your strawberry mixture over the top of the buttered biscuits and top with a dollop (or more) of whipped cream. Voila, strawberry shortcake biscuits! The combination of the sweet strawberries and savory butter is amazing! Enjoy! Yum, makes me want to run to the strawberry fields and pick fresh strawberries 🙂 Thanks for sharing on Merry Monday. This looks DELICIOUS! I know what I’ll be serving for dessert on the 4th! Hey, Liz! 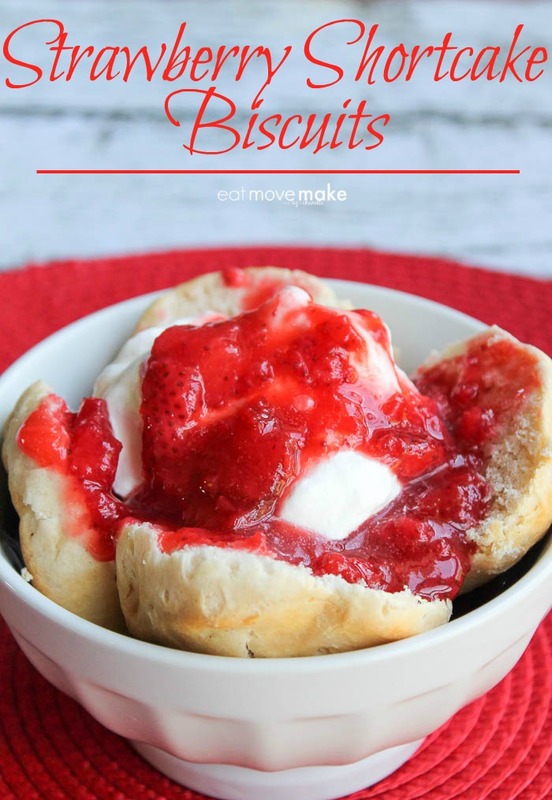 Just wanted to let you know that we loved your Strawberry Shortcake Biscuit Recipe so much when you shared it at the #HomeMattersParty last week, we’ve FEATURED it THIS WEEK! Hope you can check it out when you get a sec. Happy Friday!!! These would be so great for a Mother’s Day Brunch. Now I just have to share the recipe with my kids! We grew our own strawberries, so I’ll have to try this. I know two little boys that would LOVE it. I love how simple this recipe is to make! And strawberries paired with whipped cream are one of my favorite combinations ever! 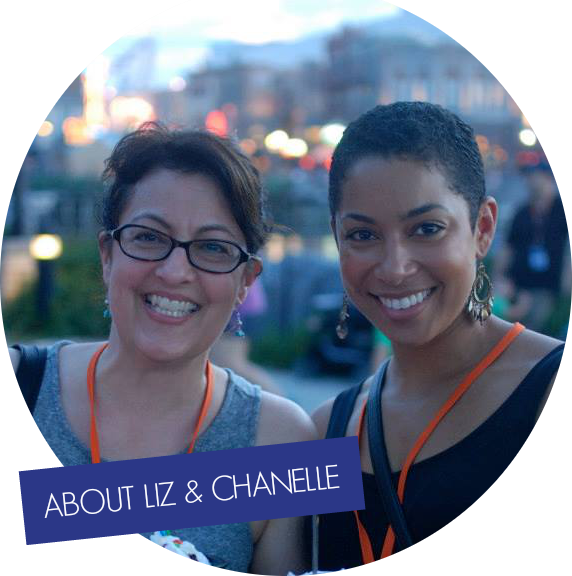 I’m your newest follower from the blog hop! YUMMMM! They look so good and so simple to make! Thanks for sharing! My Grandmother made them like this! She also did black raspberry shortcake that was my favorite! Mmmmmmm!!! That looks so yummy, BV!! Yum! I don’t know if I could do the butter with the sweet strawberries. I am kind of funny like that…hahaha! Oh. My. Goodness. That looks sooooo yummy!!! Never thought to do it with homemade biscuits!! Way to ruin my diet girlfriend! Strawberry Shortcake has ALWAYS been my favorite summer dessert. Could eat soooo much of that stuff. We can’t wait to have strawberry shortcake, but it’ll be awhile before they are ready up here in MI. In the meantime we’ve been enjoying a bit of last summer by eating up the last of the raspberry freezer jam I made last August on fresh biscuts. Yum! I would have never thought of biscuits and butter! Awesome!! I love hot biscuits with fresh strawberry jam on them too! Best ever!! that looks easy & delicious! Wow, these look delicious. I have the biscuits and butter, just lacking the strawberries. I’ll have to pick some up. can you say yum? mmmm! wow, looks so good. we are just about there with strawberry season up north, can’t wait till i can make this myself with some local berries! I am making this tomorrow…too late, today, and I don’t have any biscuits. But tomorrow, for sure! Jack will think he died and went to heaven! So will I. And then I’m going to start back at the YMCA! Looks sinfully delicious! I love strawberry season! Those look awesome! I may have to try and make some. Now this I have to try! 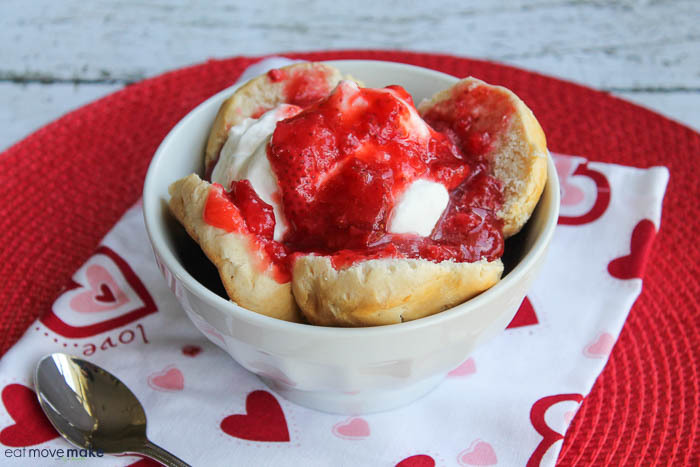 I love shortcake too, but this looks really easy and just as good! This looks both good and sinful! I’ll take your 90 degrees and you can have our 40 days and 40 nights of rain (where’s that ark?). Seriously – it’s June and we haven’t had to turn the sprinklers OR the A/C on yet. It hurts my heart. I dig the strawberries but not the biscuits; the texture of them drives me crazy. Not sure why. I’m thinking this over waffles would be divine. yummy.. I will try this for sure.. I just got stuff to make strawberry short cake.. Thanks for sharing this.. I definitely have to try this! Thank you, it sounds awesome. Yummm….I think I might be drooling just a little bit over here. Thank you so much for linking up with our meme, we LOVE having the support, it really means a ton to us. Have a super weekend… and I am SO going to try our strawberry shortcake this way. I have never had strawberry shortcake with anything but pound cake. However, yours looks delicious. Thanks for the new recipe! I’ve never had it that way, but I love Strawberry Shortcake! I like to put cut strawberries in a bowl and pour chocolate syrup on them. 🙂 This looks yummy, too! Yum! So gonna try that soon! ooooooooooooo Girl I can feel my hips getting bigger as we speak. MMMMmmmm My husband absolutely loves strawberry shortcake I’m sure this will be a pleasant change for him. Thanks for playing along with us hope to see you next week too! OH WOW! I LOVE Strawberry Shortcake!!!!! what a grand idea! My kids LOVE biscuits (but do not like the sponge cake)- what new spin on an old classic! OH goodness, I so want that even with all the butter … hehe. Ok backing out, must stick to diet. mmmmm., that looks to die for! Oh.MY.GOSH! I would eat the picture if I could. I love strawberries, especially fresh in the summer. This looks so good. It is on my must make list now! who doesn’t love strawberry shortcake??!!! I once had a student allergic to strawberries and I felt so very sorry for him- to never eat strawberry shortcake??! How does one go on? Looks yummy. I will have to try that. Yum! Gosh, just the biscuits with butter look yummy! I’ve never tried it with biscuits, but I LOVE strawberry shortcake. It DOES say summer! YUM!!!! Your look so good. Melinda made shotcakes with bisquick the other day and they ROCKED!!!!! Ooh, I love strawberry shortcake, but have never seen it as biscuits! aaaaaaaaah crap! not a good post for a gal on a diet! All I can say is yum! I love summer foods! Yum – this is a great idea! This definitely has potential for getting my little strawberry lover to actually eat biscuits too! YUMMY!! That looks so good, I’m pretty sure I just licked my screen. That looks divine! I’d love to eat that for breakfast! Wanna come over and make some for me? I will make you tea!! Or coffee! Or wine!! I am on a diet..how could you do this to me. Can I lick the spoon? There is a possibility that I might have just drooled onto my keyboard. I’ve never even thought to try these with biscuits, but YUM! oh my word those look amazing!!! These would make a perfect naptime treat. This is JR’s favorite food. Maybe I’ll make some for him this weekend. That looks yummy and super easy to make! Not only is my mouth watering as I see this.. but my hips are growing too! Wow, those look delish!! Funny enough, I had strawberry shortcake for dessert at a restaurant called Cookshop Saturday night. Instead of biscuits, they used lemon poppy bread. That looks simple enough and very yummy!! Now I can think of nothing else but strawberry shortcake. That looks easy and amazingly yummy! Yum! These look so easy and absolutely delicious! I’ll be making them for sure this summer.